Hi! Today I wanted to share my latest project with you. I have really been loving my Traveller's Notebook-style journal lately (which I made myself), and it kinda inspired me to make my own version. This style includes an overlapping flap and leather string that binds around the book to keep it closed. I've seen this idea many places, and I like the very rustic feel. Otherwhise the basic principals of the Traveller's Notebook system still apply - the elastic bands down the spine are what hold the notebooks in place, and you can replace and add as many as you want. That's what I love about the TN idea: They are completely customizable. Firstly, measure your notebook. The height of the book you want to use is going to be the short side of your fabric/leather. My notebook was 21 cm tall, so I cut my leather 22 cm wide - I like it to overlap slighty so the notebooks aren't damaged. Then you are going to cut the length to be 2x the width of the notebook + 2x the thickness of the spine + how much overlap you want to go over the front. My leather ended up being 41 cm long. Now that you have your rectangular piece of leather you want to find the spine of where the notebooks will sit (in my case it was 13 cm in). Poke two holes in the top and two holes in the bottom of the leather with an awl (about 1 cm from the edges) so they are centered compared to the spine (which was 2,5 cm, so about 0,8 cm apart). You should now have four holes directly above each other, and there should be about 20 cm between the pairs. Take out your elastic string (it should be about 1,5-2mm thick) and measure about twice the height of the notebook, perhaps a little less, but you can always cut more off. Feed the string through the holes; first from one of the top holes to the other, starting on the inside. Then bring the string down to one of the bottom holes and pass it through from the inside to the outside and back through the second hole. Now you should have two parallel strings that don't cross each other anywhere and can only be seen on the top and bottom on the outside of the leather. Tie the two ends into a knot, but make sure that the elastic is tight enough to make the leather curl just a little bit (watch video for visualization). Now you want to sew the string onto the flap of the cover. This will be on the opposite side of the front of the cover. I used an awl to poke three holes through the very end of the leather string. 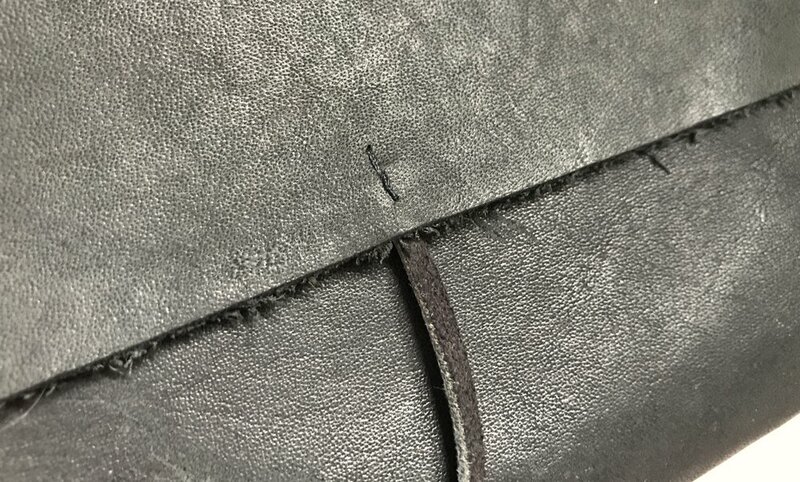 Then I attached the string to the cover by sticking through the leather and the strap, back and forth through the same three holes until it was secure. Then I cut off the excess string. A detail that is by all means optional is to round the corners off. I just used the corners of my ruler, which were a bit rounded, as a guide for this. I think it gives the whole book a more polished and professional look. This is a guiding illustration and not completely proportionate. Remember to adjust measurements to fit your own notebook's size. Now all you need to do is insert your notebooks and whatever other fun things you can think of. I hope you enjoyed this little tutorial/DIY project. Until next time!